At this market situated across a railway track in Thailand's Samut Songhrkam province, traders move their stalls aside to let the trains pass. And as vendors scramble to clear a path, tourists – up to 2,000 a day – flood the tracks with cameras and smartphones raised to capture the arresting sight. Trains may pass through seven times a day, but the market – known as "Talad Rom Hoop Market" or "Umbrella Pulldown" Market, after the vendors' low-hanging awnings – existed long before the tracks. Many of its visitors arrive on the railway itself, making the 37-kilometre journey from Bangkok, while others visit as part of organised tours. The market's unusual situation has made it a must-see for tourists after an Instagram-worthy day trip. Lucas Caravalhio, who visited the market from his native Brazil, attested to its online reputation. "Well, we know this market from the internet, and we got to view some blogs and some WhatsApp channels that told us about this place." The market has seen its popularity steadily increase since Thailand's tourism authority (TAT) launched its Unseen Thailand campaign, in an effort to counteract the negative impact on the country's tourism industry of the 2003 SARS (Severe Acute Respiratory Syndrome) epidemic. Unseen Thailand touted the Southeast Asian nation's unusual sights, offering special promotions to both international and domestic travellers and, despite visitor numbers dropping by 10%, more than ten million people visited the country that year, according to TAT. By 2018, the figure was a record 38 million – and at least two million of them visited Maeklong and its railway market. 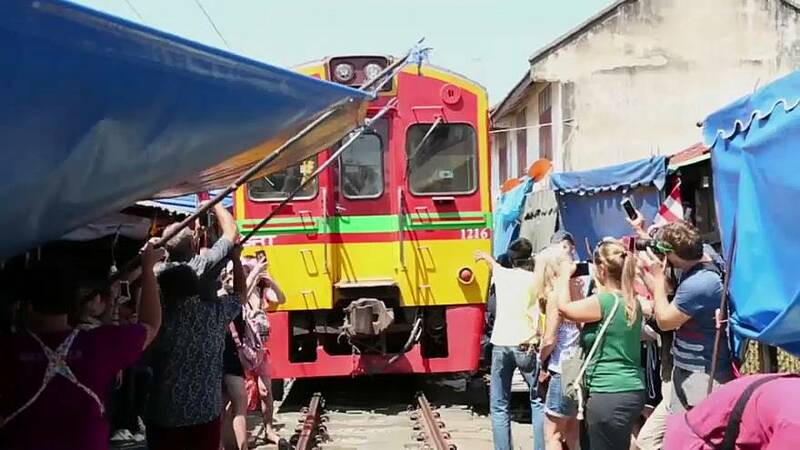 When Maeklong Rail Company built the line, at the turn of the 20th century, local sellers decided to continue staging their market as normal, just moving their produce out the way when trains approached. Noppadol Imemkosa, who runs one of the market's busiest restaurants, said: "This is not complicated for us. It is somehow beneficial for the market, as it has made it an attraction to tourists and more tourists are coming to see this reaction." Along with the other vendors, Imemkosa ensures the tourists are standing behind the red safety line as trains pass: "My duties, things that I have to do are firstly I must remove all the tables and seats, put the fruit baskets inside, and rearrange the tourists that have gathered, they must stand behind the line. Make sure that tourists safe and all this in a total of three minutes." Further down the tracks, 60-year-old Mrs. Lek is touting mackerel fish. She rents her market stall for around €1.80 a day. "I have seen the change in this market because there are more tourists coming here now," she said, adding that her customers are locals who prefer to stay away when the market is busy with tourists. "My income has reduced. The tourists visit, but they don't buy mackerel fish," she says. "If I was selling ready-to-eat fruit, that would make a good income as tourists would buy it."